Please contact me for an accurate quote, homeaway.com quote format does not work for rate specials. Rate will be cheaper from homeaway.com rate quote. The more days you request after a weekend the cheaper it will be. (3 NIGHT NON-HOLIDAY MINIMUM) Contact me today. Our charming townhouse is kid-friendly and having high speed WiFi/internet and many cable channels, it is the perfect home away from home for the whole family. This home is located in the community of Four Seasons and sits across from Camelback Adventure, Ski Resort, Camelbeach Water Park, Camelback Indoor Waterpark. You can now also purchase indoor waterpark passes at Camelback with your stay at my property, and you can also go to Kalahari Resort, America's Largest Indoor Water park and purchase day passes. Enjoy skiing, snow tubing, swimming, water park rides, horseback riding, hiking, outlet shopping, MT. Airy Casino, Bushkill falls(The Niagara of Pennsylvania) and much more. Our townhouse gives you faster access to the parking area of camelback resort, coming from the opposite direction of the traffic - going down the mountain, not up the mountain. Spend less time on the long line and more time enjoying the water park and skiing/snowboard. We are also less than a 15 minute drive from Kalahari resort which is America's Largest Indoor Waterpark. Kalahari also offers day passes to the public. In the spirit of Halloween there is an attractions called the Hotel of Horror Haunted House and Waldorf Estate of Fear and each is less than 30 minutes from the house. These attractions runs every weekend from September 19th to November 1st. The house is Beautifully decorated and well maintained. When you enter our townhouse the first thing you see is our Living Room with the cathedral ceilings and our wood burning fireplace with a large and airy feel! A perfect family retreat! Cozy up by the wood-burning fireplace and enjoy the ambiance of a warm and bright crackling fire with a glass of wine, high cathedral ceilings, and natural wood accents, the living room is so cozy that you'll feel instantly at ease. The decor in the home is warm and inviting and we want your family to feel relaxed and at home during your stay, and we hope you'll enjoy your experience enough to come back! 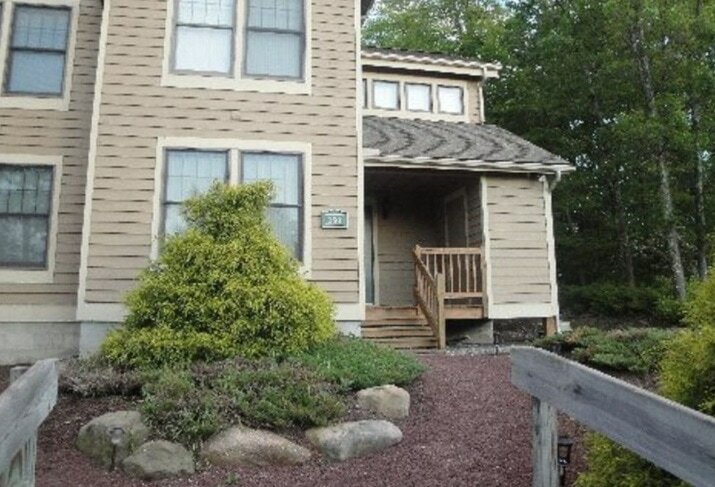 One look at this lovely 2-story home, and your family will love it as much as ours does! Winter, summer, or in-between, this is the perfect place for your vacation or for just a weekend away from the rat race from a Licensed vacation rental owner. Our past renters have stated how they love entering our beautiful townhouse. They feel immediately comfortable and don't want to leave. Read our reviews and see how people comment that the pictures don't do the townhouse justice! It has 3 bedrooms, 2 levels with a deck. One bedroom with queen bed, Second room has 1 full/1 queen bed. Third room with 2 twin bunks. All bedrooms and living room have flat screens with DVD players and cable with HBO and many sports channels including the YES network for Yankee fans and the SNY network for Met fans. Our kitchen is fully stocked with all you would need to prepare a meal. Just bring your own food and spices. Our kitchen includes a dishwasher and a washer/dryer. Along our counter we have 3 new stools to have a quick snack or drink. We have a dining room next to the kitchen with seating for 10. Our townhouse has an open floor plan for the Living Room, Dining Room and Kitchen. Be a part of the conversation, from any part of these rooms! Go onto the deck via the sliding glass door in the dining room & enjoy the outdoors while you BBQ. In the Spring/summer/Fall enjoy the new zip line, Euro Bungy & Segway tours at camelback mountain adventures Camelback Indoor Waterpark, Kalahari Indoor waterpark. In the summer, after a long day of hiking, swimming at the Water park or relaxing at the community outdoor heated pool, kiddie pool & swings and tennis courts, all located on the community grounds. you will enjoy coming into a cool house. We have a central air conditioner and ceiling fans with remote controls. Also, the central air conditioner will be appreciated after shopping at the over 100 outlets stores, just 5 minutes away! The development also has a small fitness center which can be accessed for a small fee. 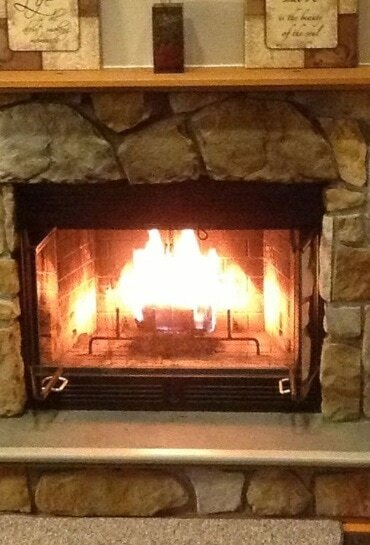 In the winter, enjoy the wood burning fireplace after a long day of skiing or having fun at the indoor waterpark. There is nothing like the glow of the fire to relax and heat you up, making it warm and inviting! NIGHT SKIING is offered at Camelback Ski Resort. One of the few places in the area that offers this! Enjoy the night lights from Camelback Ski Trails. The lights, from night skiing, makes it look like a big lit-up Christmas Tree, in the winter! Breathtaking! Clean linens and towels are provided, as well as a starter pack of toilet paper, hand soap, paper towels and dish washing detergent. No need to rush to the store and buy the essentials. For the outdoors men and women there's a shooting rage 15 minutes away, use your firearms or theirs. Kids welcomed. Shawnee mountain ski area and Big Boulder and jack frost ski area is less than a twenty minute drive away. Blue mountain ski resort is less than a 1/2 hour away. SUMMER AND WINTER DATES GO FAST! SO BOOK YOUR GETAWAY TODAY!!!! DON'T WAIT FOR THE LAST MINUTE! Renter must be at least 25 years old unless accompanied by parents. Families with young children welcome. - 90 minute drive to NYC - perfect for those traveling from far away to visit the BIG APPLE for a day. It's a straight ride to the George Washington bridge, Route 80 which turns to I-95 when you reach Teaneck NJ, close to the GWB. No matter what your interests, you'll find an abundance of activities close by or a short drive. We are a family owned operation, we care that you enjoy your stay in our home, and we will make every effort to provide you with the best accommodations for your dollar. This is not a timeshare or corporate owned unit. We live here too, and we visit often to insure everything is functioning properly and in good condition. It's just not a rental, it's a home away from home. This is not a party house. Please check your spam and junk folders also for your quote just in case it didn't go to your inbox folder. If you don't get a email response on the first day please call me at 718 781 9001. Thank you. We welcome and encourage rentals by families with children of all ages. However, we cannot rent to individuals under 25 years of age who will not be accompanied by an adult parent or guardian for the entire stay. No Prom Groups. No Bachelor parties. This is in accordance with Northridge community guidelines & covenants, and exceptions will not be made. Community rules. Maximum occupancy is 8: The home accommodates a maximum of eight guests in total.